FlyCemair is the brand under which Cemair (Pty) Ltd trades its scheduled flights. The FlyCemair brand was created to distinguish between the aircraft leasing and charter side of the Cemair business and its scheduled/ regular flight services. Cemair has been in operation since 2005 and was originally based at Lanseria Airport. At the End of 2012 Cemair moved their operation to OR Tambo International Airport. The Owner/ CEO of Cemair is Mr Miles van der Molen. The High Court has dismissed the airline's application with costs. This leaves the airline with little alternatives to compliance with the SACAA's rules in order to resume operations. “The Air Operation Certificates will remain suspended until such that the airline has adequately addressed the safety concerns or findings uncovered by the SACAA during a recent renewal audit,” the SACAA said in a statement. The airline does however plan to follow an appeals process and has plans to approach the Public Protector. After the latest suspension of their services, FlyCemAir is waiting on a court to determine their future. The airline was grounded for a third time on the 11th of January 2019. CemAir then approached the High Court seeking relief from a judge. Judgement is expected on the 24th of January 2019, but it is uncertain what the future holds for the airline should the ruling not be in their favour. Following a short grounding by the South African Civil Aviation Authority (SACAA) from the 13th of December 2018, FlyCemair resumed operations on the 20th of December 2018. The airline took the SACAA to court and had the suspension of their Air Operator Certificates overturned. On the 24th of February the South African Civil Aviation Authority (SACAA) lifted their temporary suspension of CemAir’s Aircraft Maintenance Organisation (AMO) approval. This was not done lightly and the airline had to complete a five-phase certification process which included document evaluation and demonstration phases. Whilst all twelve of their aircraft were not immediately declared air worthy, they slowly resumed their route network as aircraft were cleared. Daily flights between Johannesburg and Margate were re-instated on the 7th of March and on the 15th of March they added flights between Plettenberg and Johannesburg back as well as flights between Plettenberg and Cape Town. On the 23rd of March 2018 they also resumed flights between George and Bloemfontein. The last routes to be resumed were flights between Port Elizabeth and Bloemfontein as well as their route from Margate to Cape Town via Plettenberg bay. On Friday, the 2nd of February 2018, the South African Civil Aviation Authority (SACAA) withdrew FlyCemair's Certificate of Airworthiness for twelve of the airline's aircraft. This decision follows the release of an audit that revealed that unqualified personnel had cleared the twelve aircraft as airworthy and has resulted in the grounding of all twelve aircraft and subsequent cancellation of flights. Although the temporary suspension was only supposed to last for 24 hours, it has now been extended as FlyCemair has been working with the SACAA to bring their aircraft in line with regulations. CemAir has tried to accommodate all affected passengers on other carriers, but there is no details yet as to when operations will resume. Passengers are encouraged to contact the airline to confirm alternative flights. The airline recently applied for four routes into Botswana, including Johannesburg to Gaborone, Maun and Kasane and Cape Town to Gaborone. Cemair CEO Miles van der Molen has said that Botswana has already approved the route and that they are just waiting on word about the frequency. This will likely replace Cemair's wet-lease deal with Air Botswana according to which they operate Cape Town - Gaborone flights on behalf of Air Botswana. A codeshare would be much better suited. This seems to be the start of a massive expansion operation for the airline as they plan to apply for additional routes into SADC countries as well as plann on expanding their domestic routes. They've recently added a Bombardier Q400 to their fleet with a CRJ 900 soon to be added. 09 June 2017: FlyCemair had to temporarily suspend flights between Cape Town and Plettenberg Bay as a wildfire spread throughout the region and threatened the airport. Extreme winds due to the Cape Storm also contributed to poor visibility and made it difficult for firefighters to contain the flames. The airport was lucky with little to no damage and flights were able to resume on Friday morning, shortly afterbeing forced to close on Thursday. All FlyCemair passengers to scheduled to travel on Thursday and Wednesday's affected passengers were offered alternative flights or refunds. 4 May 2017: FlyCemair has confirmed that they will commence year-round daily flights between Johannesburg (OR Tambo) and Hoedspruit from the 7th of August 2017. There will be seven flights weekly operated on either their Bombardier Dash 8 Q300 or Bombardier CRJ 200. Both flights will be afternoon flights. 1 March 2017: FlyCemAir will launch year-round weekly flights from Margate to Cape Town, via Plettenberg Bay, on the 15th of March 2017. 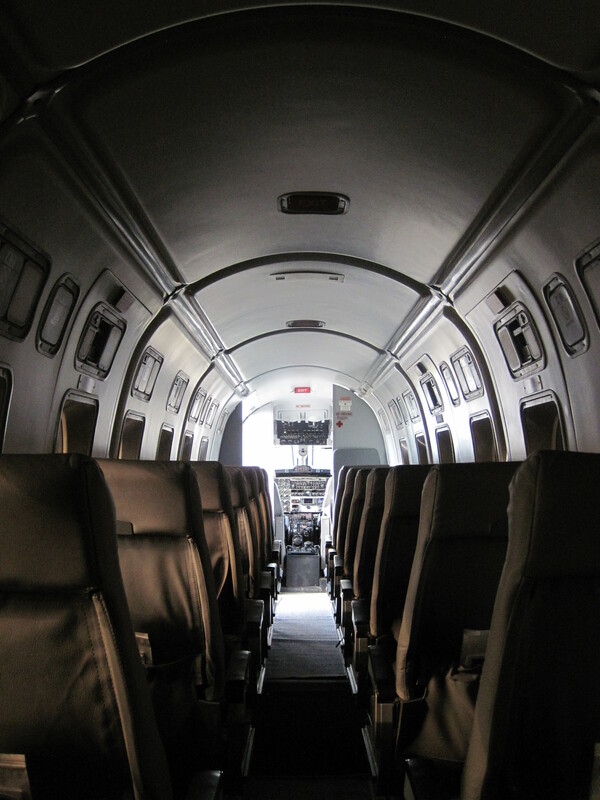 The flight will be serviced by CemAir’s 19-seat Beech 1900D. “We are launching the Margate-Cape Town route because it is very difficult to get from KZN to Cape Town. 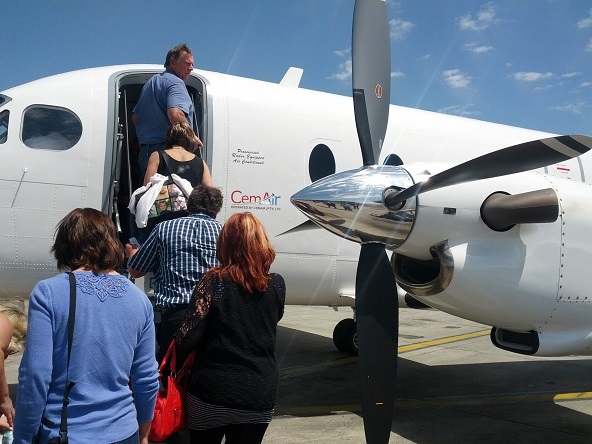 Although going by road to Cape Town is the same distance as from Johannesburg, the route is a difficult one to navigate” said Laura van Molen, CFO of CemAir, adding that the airline had had a lot of requests to connect the South Coast to Cape Town. FlyCemair has just announced their Skyrewards Program for frequent flyers. Simply log onto their website, follow the Skyrewards link and sign up to receive your membership number. Once you've earned your first 10,000 Miles you'll be issued with a card. You'll earn miles for each scheduled Cemair flight you complete, granted that your membership number has been entered in the booking (you can claim missing miles up to 60 days after your flight). Miles earned are based on the distance you travel as well as the fare you pay. Miles expire after two years and can be used to book flights online (bearing in mind that you have to pay by debit/credit card for your Airport taxes and VAT). You can also check your balance online. From the 18th of May 2015 FlyCemair passengers will able to check-in online for their flight 48 hours before departure. Passengers will be able to pre-select their seats, print boarding passes and obviously check-in. This service is unfortunately not available at Sishen airport. If you've made your booking through a GDS you'll have to contact the FlyCemair call centre for a unique ticket reference number before you'll be able to check-in online. 2016-10-07: FlyCemair's first flight between Bloemfontein and Port Elizabeth took off on Tuesday and the airline will now offer two weekly return flights on Tuesdays and Thursdays. 2016-09-15: From 1 October 2016, Fly CemAir will offer flights between Johannesburg and Plettenberg Bay. They currently offer three weekly flights between Cape Town and Plettenberg Bay and five weekly flights from Johannesburg, some of which are one way. 2016-08-22: FlyCemair will launch two weekly flights between Bloemfontein and PE on the 4th of October 2016. Flight will depart Bloemfontein and PE on Tuesdays and Thursdays. Prices for a one-way flight start from R1 599*. 2016-05-09: FlyCemair are adding two flights between Bloemfontein and Joburg from the 15th of May 2016. This follows last week's increase to daily flights from Monday to Saturday. “People are really impressed with our level of service and have requested us to add these additional flights in order to give them more flexibility,” said FlyCemair. 2015-12-08: From the 10th of December 2015, FlyCemair will be flying between Bloemfontein and George from as little as R1499*. 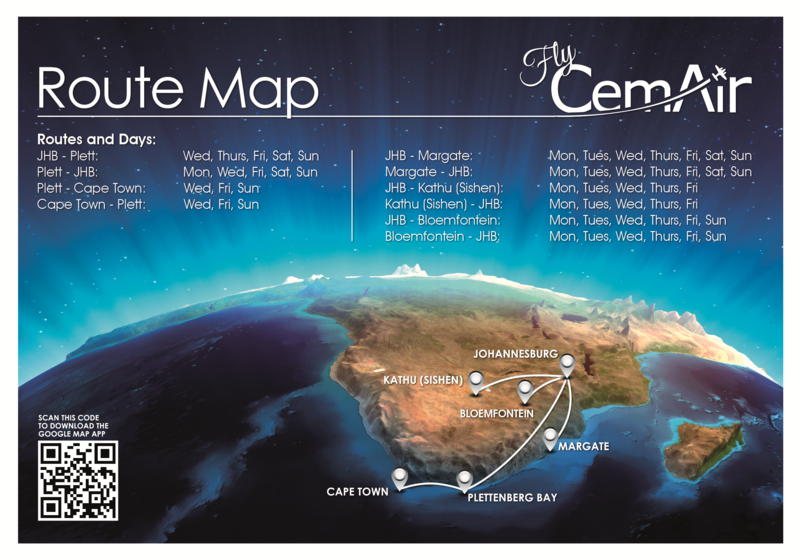 2015-06-23: Cemair has announced that they will be increasing their Johannesburg - Bloemfontein flights from the 20th of July 2015. They are introducing additional early morning flights from Bloemfontein (06h15 arriving 07h15) and late evening flights back from Johannesburg (18h30 arriving 19h30) on weekdays. This is ideal for business travellers. 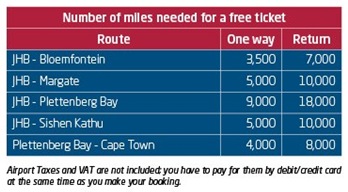 2015-05-1: FlyCemair are increasing capacity on their OR Tambo to Margate route from the 22nd of June 2015. 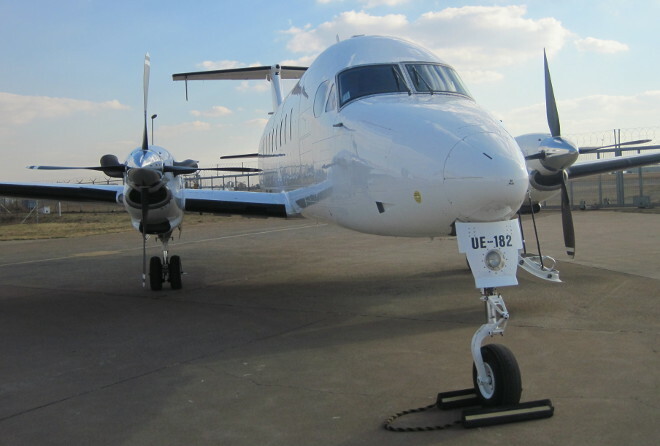 They will exchange the previous 19-seater plane with a 37-seater and the service will become a same-day service with flights from Johannesburg returning early evening. 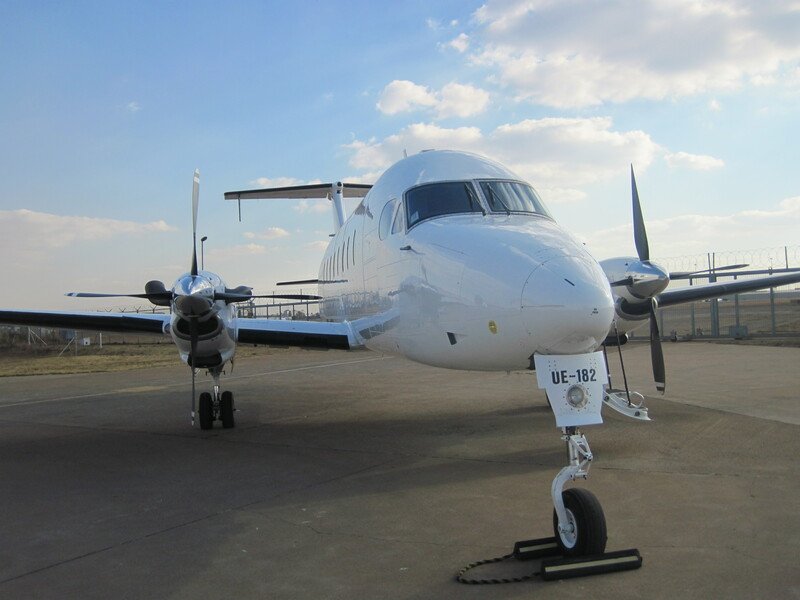 2015-01-16: Cemair has announced that they will be launching a scheduled flight service between OR Tambo in Johannesburg and Bram Fischer Airport in Bloemfontein. Cemair will be operating 12 return flights a week between JNB and BFN from the 23rd of February 2015. The flights will be operated by a 50 seat Bombardier CRJ jet. Total time in the air will be 35 minutes and from gate to gate the flight will take around 50 minutes. The airline will be targeting business travellers with this new flight offering. There will be two flights a day on weekdays and one flight a day over the weekend. During the week flights will depart Johannesburg at 06h30 and 14h30, arriving at 07h25 and 15h25 respectively. Weekend flights will depart at 13h30 and arrive at 14h25 in Bloemfontein. Weekday flights from Bloemfontein to Johannesburg will depart at 08h00 and 16h00, arriving at 08h55 and 16h55 respectively. During the weekend flights will depart Bloemfontein at 15h00, arriving at 15h55 in Johannesburg. 2014-11-28: FlyCemair are planning to launch a possible new route between OR Tambo International in Johannesburg and Grahamstown to be launched in March 2015. The airline will be hosting an information session in Grahamstown where all interested parties are invited to attend and share their opinions on the proposed service. It has been reported that the terminal and the runway in Grahamstown is being upgraded for the new service. CemAir CEO Miles van der Molen said that they are looking at starting with three flights a week on the proposed route initially. 2014-11-18: CemAir has taken delivery of its new Bombardier Dash-8 aircraft. The aircraft be flying on the JNB - Margate and JNB - Plettenberg Bay routes from the beginning of the festive season. The airline owns 9 Beech 1900 twin turbo-propeller aircraft which seats 19 passangers, 10 Canadair CRJ regional Jets which seats 50 passengers and now one Bombardier Dash-8 which seats 36 passengers. 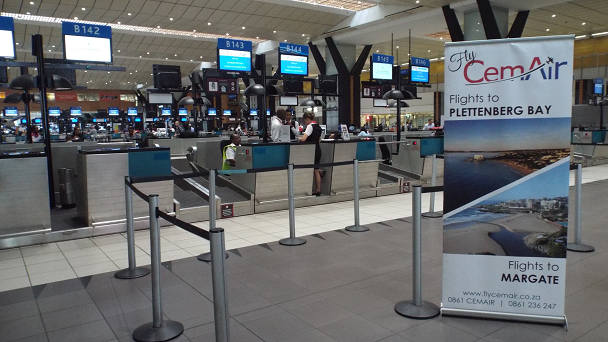 2014-11-14: FlyCemair has almost doubled their flights from OR Tambo to Plettenbergbay and Margate for the festive season. They will now offer daily flights to Margate and Plettenbergbay. 2014-10-22: FlyCemair has signed an agreement with Travelport which will see Travelport become Cemair’s Global Distribution System (GDS). This means that agents connected to Travelport will be able to book Cemair directly through their booking engine. The agreement will give Travelport-connected agents access to CemAir’s full content and live web fares. CEO of CemAir, Miles van der Molen, said, “Travelport’s extensive, world-wide travel agency network complements our ambitious growth plans, making them a valued partner and an important distribution channel. We look forward to building a close working relationship with Travelport as we take our business activities to the next level.” The airline is said to launch more routes in the near future and they hope that this new partnership will cause an increase in the selling of seats on the existing routes as well as on the routes that are to be added. 2014-10-13: Cemair will reportedly be trading in their last two Beech 1900C aircraft for a Dash 8-100. Cemair also operates a fleet of Beech 1900D aircraft. The Beech aircraft has a maximum capacity of 19 passengers while the Dash can take up to 39 passengers on board. It seems like the airline is looking to fly a higher volume of people on single flights which means that they must be seeing growth in one or more of their routes. 2014-06-05: CemAir recently announced their purchase of a large package of Bombardier CRJ aircraft which had formerly been operated by Delta Air Lines. The package not only includes aircraft but also engines and other aircraft parts, this acquisition has substantially boosted the airline’s fleet. The acquisition will see FlyCemair operate more than 10 aircraft over the course of the next year. The growth of FlyCemair is a very positive sign for the consumer as they will now have more options to choose from regarding airlines and routes as more routes will certainly be opening up. 2014-04-16: FlyCemair run a survey to see whether there is an interest in flying from Cape Town to Kathu/Kuruman in the Northern Cape Province of South Africa. Kathu is the centre of iron ore mining in South Africa, as well as chrome & manganese. The town is within 100km of the famous Hotazel. 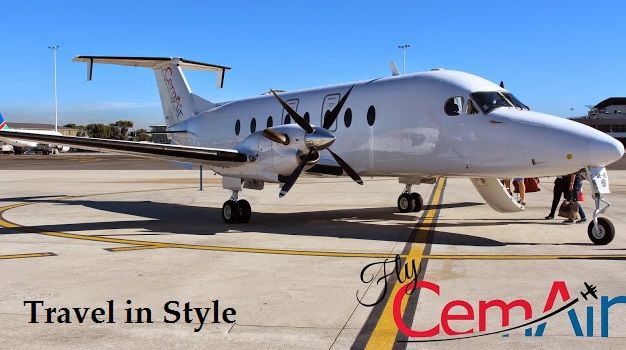 2014-03-28: On 28 March FlyCemair launched flights from Johannesburg to Plettenberg Bay and between Cape Town & Plettenberg Bay. Note that all prices listed on this page may well have changed. 2013-11-01: FlyCemair launched their OR Tambo to Margate route on the 1 November 2013, starting out with Friday and Sunday flights leaving OR Tambo at 15h00 and returning from Margate at 17h00. From the 22nd of June 2015 FlyCemair will introduce additional flights between Joburg and Margate with the service becoming a same-day one with flight to Joburg leaving early in the mornings and returning to Margate early evenings. FlyCemair will also move away from the Beechcraft 1900D planes which could only carry 18 passengers to the Dash 8 which can carry 37 people. 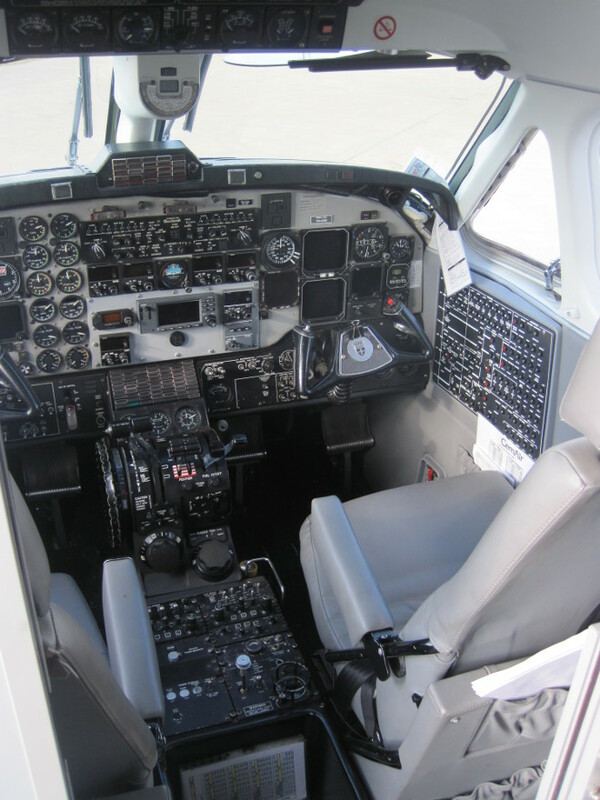 Fly Cemair flights are in Beechcraft 1900 aircraft. Book by emailing plett@cemair.co.za or phoning 0861-236-247. The luggage is limited to soft hand luggage - maximum 20kg per passenger. FlyCemair has partnerships with Avis Rent a Car and Europcar, whereby you get can cheaper car hire rates, exclusive to Cemair passengers. What does C.E.M.A.I.R. stand for? In February 2013 Cemair Acquired a company by the name of fly Twenty60, who operated flights between OR Tambo International Airport and Lephalale (Limpopo), and at the end of that same month Luxair was acquired - Luxair operated flights to Sishen/Kathu in the Northern Cape.